This tutorial is designed for complete beginners, and guides you through the basic email usage. The tutorial is divided into sections and at the end of each section you will find a short quiz designed to test your understanding of that section. The Quizzes are optional but strongly recommended. At the end of this tutorial you will find extensive links for further reading. To use Email you will first need an email account. Most people will use an email account and email address from a free email provider like Yahoo, Gmail or outlook.com. An email account is a username/password combination that gives you access to a mailbox. The mailbox is the location where email is stored and is usually spit into folders. You can liken a mailbox to a filing cabinet. 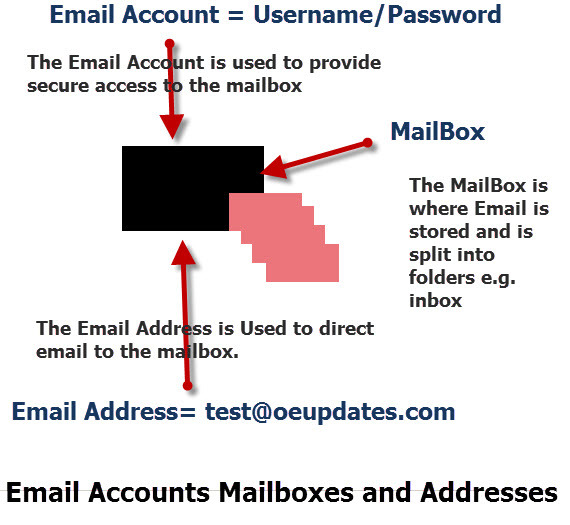 The mailbox will always be located on an email server belonging to your email provider e.g. Yahoo. The email address is a label attached to the mailbox and is used for delivering mail to the mailbox. The email address serves the same purpose as your house address or your phone number. Usually there is one email address per email account and one email address for each mailbox. However you can associate a mailbox with multiple email addresses. These extra addresses are usually known as aliases. Additionally you can link email addresses together using a technique called email forwarding. Here is a example email address. An email address consists of two distinct parts separated by a @. The first part is the mailbox name which you will normally choose when creating an email account with Yahoo Mail ,Gmail, Hotmail. 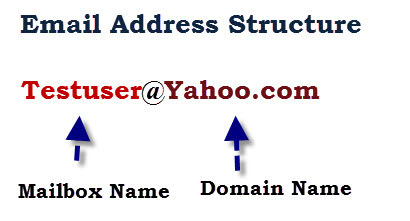 The second part is the domain name which is fixed when using Yahoo Mail ,Gmail and Hotmail. Technically the mailbox name is case sensitive which means that testuser and TestUser are different mailboxes, but this is seldom enforced and so in practise they are considered to be the same. Businesses usually register and use their own business domain name. A Mailbox is divided into several folders to better organise your email. Email messages are placed into folders and can be moved between folders. sent items – Contains a copy of emails that you have sent. bin deleted items or trash -Goes by several names and stores email that has been deleted. You will normally need to manually empty this folder to completely delete the emails, however some email services will do it automatically after so many days. You can recover emails from this folder if you have deleted them by mistake. Drafts- Stores a copy of emails that you have created but haven’t been sent. What does an Email Account consist of? Where would You Find Your Mailbox? A Mailbox is divided into? You want to look at an old email that you sent, where can you find it? To access your email you will need to use an email client. These types of client need to be installed on the computer that you are using, and they need to be correctly configured before you can send, and receive email with them. These clients are simply web browsers e.g. Google Chrome, Internet Explorer etc . Because almost all computers and smart phone/tablet have a web browser installed, it means that access to email can be accomplished on any device and from any location. Webmail is probably the most used method of accessing free email providers like Gmail,Yahoo Mail and Hotmail. 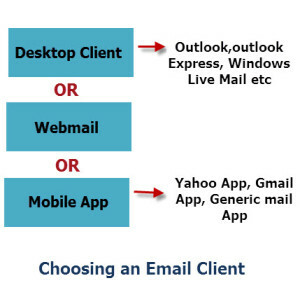 You want to access your email from a friends computer which email client should you use? You have Installed The Yahoo Email App on your Tablet what do you now need to do to access your Yahoo mailbox? You Want to access your email from your desktop client and App on your Tablet is this possible? To send an email you will first need to create or compose an email message. If you click on the compose message link ( new message link) a new message form opens. Although the new email message form will be different depending on the email client you are using the common fields are the same. FROM– Not normally visible unless you have multiple email accounts and addresses configured. Defaults to your default email address. TO -You need to enter the email address of the recipient in the to field. You can enter multiple email addresses usually using a comma to separate them. You can also use the contacts list or address book to add addresses and most email clients will automatically suggest email addresses and names as you type. Note: Names only appear if they are in your address book(contacts list). 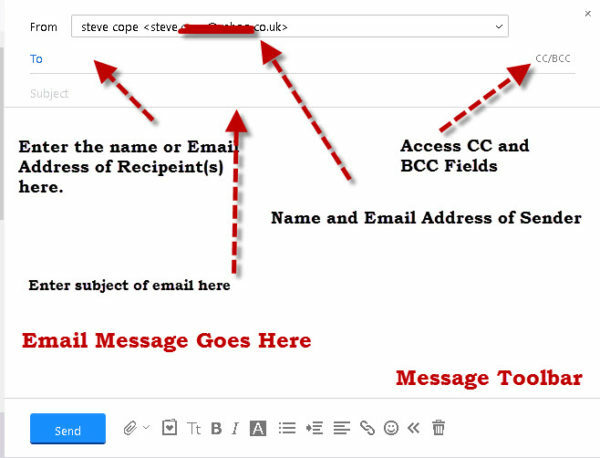 It is recommended that you always use the bcc field when sending messages to confidential mailing lists. Subject Field –This should contain a brief summary of the content and should always be used, but is not mandatory. If you leave this field blank then some email systems may reject the message as spam. Content Field- This contains the main email message and if you are using HTML email (default) it can contain text and images. You can leave this field blank. Attachments are files like documents and pictures that you can include with your email. To add an attachment look for the paper clip icon. All email providers limit the size of attachments with the standard being around 25MBytes. When you click send the email is normally sent immediately and cannot be cancelled or retrieved. A copy of the email is placed in the sent items folder. Your mailbox is divided into a number of folders and incoming email is normally placed in your inbox. Most email clients display a list of emails showing the sender and subject with unread emails shown in bold. They will also often show a preview of the email that you have selected. Clicking on an email subject will open up a new window with the email displayed. When you click on either link a new message form will appear with the original email inserted as part of the message. You can then add new recipients as required using the to, cc and bcc fields. If you send email to someone on a regular basis then rather than typing in the email address manually each time you can store their address details is a contact list or address book. You can add contacts to the list manually, but most email clients will also do this automatically when you send and receive email. They also provide import and export features so that you can move the contacts between email systems. When you Click send What Happens to your Email? You have sent an email but regret sending it. Can you recall the email? Can You send an email to multiple recipients? Why would you add a recipient to the CC field and not the to field? Because they don't need to do anything, but need to be informed. Because they have to respond to the email. Can You send pictures with your email? You have received an email and want to reply. What do you do? You have moved from using Yahoo Mail to Gmail. You have created 100s of contacts in Yahoo Mail how do you get them into Gmail? Email is considered an insecure communications mechanism and so don’t send confidential information by email unless you take steps to secure it. See Email Security Basics. Please use the comments section to let me know how I could improve this guide.